Washington, DC – The U.S. Supreme Court today upheld the constitutionality of Maryland’s groundbreaking “No Representation Without Population Act,” which counts incarcerated people as residents of their legal home addresses for redistricting purposes. The 2010 law was a major civil rights victory that ended the distortions in fair representation caused by using incarcerated persons to pad the population counts of districts containing prisons. The law upheld today is a state-based solution to the long-standing problem in the federal Census of counting incarcerated people as residents of the prison location, even though they cannot vote there and remain residents of their home communities for virtually all other legal purposes. 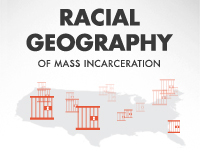 The practice of prison-based gerrymandering particularly harms urban communities and communities of color that disproportionately contain the home residences of incarcerated persons. Other states have since passed similar laws, but the Maryland law was the only one to go to the Supreme Court. “Today’s Supreme Court decision in Fletcher v. Lamone affirmed the constitutional ‘one person one vote’ foundation of our decade-old campaign to end prison-based gerrymandering,” said Peter Wagner, Executive Director of the Prison Policy Initiative and the nation’s leading expert on how the Census Bureau’s practice of counting incarcerated people as residents of the prison locations harms the democratic process. The plaintiffs in Fletcher challenged Maryland’s right to correct where incarcerated people are counted for the purpose of drawing congressional districts. “Congressional districts are held to the highest standards to ensure population equality.” said Brenda Wright of Dēmos. “The Court’s decision that Maryland’s law satisfies the strict standards applicable to congressional districts clears the path for other states to pass similar laws at all levels of government.” New York, Delaware and California have already enacted similar legislation, and advocates are calling on the Census Bureau for a national solution. “Today’s ruling by the U.S. Supreme Court affirming that Maryland’s law both meets constitutional requirements and was fairly implemented will hopefully encourage the Census Bureau to change its policy on where incarcerated people are counted in the 2020 Census” said the Prison Policy Initiative’s Peter Wagner. 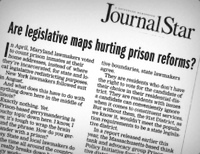 Maria Morales writes on the civil rights victory that was won when the U.S. Supreme Court upheld Maryland’s law ending prison-based gerrymandering. The Court is expected to announce on Monday whether or not it will hear the case challenging Maryland’s first-in-the-nation law ending prison-based gerrymandering.